A new set of Mens Pilates, Core Strength and Flexibility Classes starts during the week of Monday 7th of May and Monday 14th of May 2018 in the greater South Dublin area, Dublin 14, Dublin 16 and Dublin 18. The classes and courses run in eight-week blocks. There is generally a maximum of 8-10 participants per class, meaning the classes are rather small and this allows me to offer a good degree of individual attention. Benefit from 16 years teaching experience, I worked with hundreds of individuals of all ages mid/late teens to individuals in their 90s, busy mums, business owners, desk-bound office workers, retired people, various groups and individuals from sports like rugby, GAA, soccer, tennis, long-distance running and golf. View the video below for class details, check my full exercise and fitness class timetable here or contact me if you have any further questions or to book a class. This entry was posted in in South Dublin, Pilates Classes, Pilates for Golf / Golfers, Pilates for Men, Sandyford Community Centre, Taney Parish Centre, Videos and tagged in Dundrum, in Leopardstown, in Sandyford, in South Dublin, Martin Luschin, May 2018, Mens Pilates, near Foxrock, near Kilternan, near Stepaside, Pilates for Men, with Martin on May 7, 2018 by admini. Have you ever seen guys (or girls) doing freestanding handstands or handstands against a wall and wondered how do they do that? Or wondered about another skill someone has, and you thought “Will I be able to do that?”. I did exactly that early last year, 2017 after a shoulder injury that dragged on for over three months and didn’t allow me to use any arm/shoulder/upper-body weights-exercises at all. That’s a real challenge for someone who is used to exercise five to six times a week. 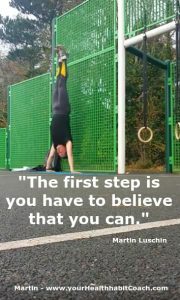 I wondered “will I be able to do that?” … “How do I start a handstand practice routine and do progress over time?”. So off I went, using our beloved Google-Search engine, ending up in various odd corners of the internet from Vimeo, to youtube, other video websites and digging out different manuals from the “experts” around the globe. 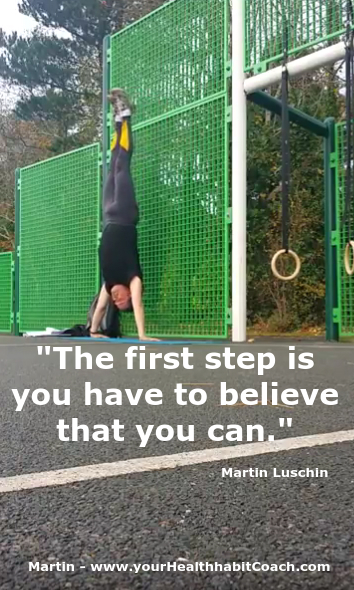 There were different logical approaches; some were just ridiculous “you just do handstands” others made more sense, some guys split it into small steps and progression, e.g. building up strength, mobility and balance in the wrists first, then practising what is often called a Yoga Frog stand. Others demoed and explained various practise drills and options. E.g. a wall facing version and a version having your back to the wall, some suggested to start doing pike-push-ups (easier version with your feet on your couch or on the floor) etc. etc.. There were too numerous variations to list them all. So off I went and started my self-created little routine and programme, as every personal fitness trainer and coach would do. After two weeks (two to three practise sessions) I was able to kick reasonably comfortably up against a wall and get into a (what I would now call a “pseudo-handstand” or what others call a “Banana-handstand.”. The “Banana-handstand” is a position where your whole back is excessively arched during the handstand – a no-no (that’s what my Pilates & Core Strength Brain told me). I decided then that I would demo my “Banana-handstand” in one of my exercises and fitness classes and offered participants to coach them in the various sub-skills. They just looked at me in disbelieve, I couldn’t believe that they wouldn’t even consider trying it. Some of the guys were, without doubt, strong and mobile enough, to give it a go. I tried to do a bit more convincing and showed different simple starter drills …. they just didn’t believe or wouldn’t contemplate that they could do it. It meant they were not giving themselves permission to even try the easy starter hand-stand drills …. then it dawned on me … I have to enable them to change their mindset first, and that is were Will Smith with his quote comes in “The first step is you have to say that you can.”. You might replace the word “say” with “believe” to “The first step is you have to believe that you can.”. If you believe you can, you are at least more likely to try something new or different, but without a convincing “Yes, I can” or “Yes, I will be able” or “Yes, I am going to” the individual reduced the chances of success dramatically. That is one of the main reason’s why I meet new personal coaching and training clients initially for a relaxed chat and see what do they believe about themselves and where do they see themselves, where would it help them to alter or even change their thinking and beliefs. 1. What if I would get up a bit earlier every morning to have a few minutes of me-time (even 5-10mins) before the rest of household gets up? (You might write in your diary, have a relaxed cup of tea, jot down three successes or positive things that happened the day before etc.). 2. What if I would plan my day the night before? (most people find this extremely useful, as it allows them to switch mentally off before going to bed and in a lot of cases enables them to get a better night sleep). 3. What if I would schedule two or three regular 20-30min activity or exercise session into my weekly diary? (Having fixed, regular activity sessions on the same day and time makes it easier for your mind to get into a healthy routine – consider these sessions as important as an appointment with a doctor, your boss or manager, someone you value lots. 4. What if you would do at least one activity or one action (even just for 5-10 minutes) every day that excites you? (Doing positively exciting things generally boosts your energy and makes you feel good). 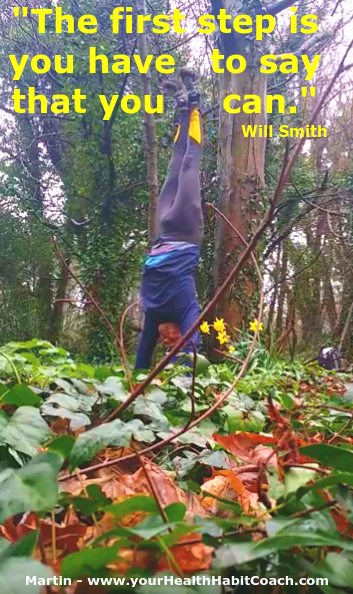 After a detour to Will Smith’s quote, beliefs and “What if – Questions” back to my Handstand story. In the meantime I’m able to hold a “straight” wall-handstand or tree-handstand 🙂 for a good while, can do a few mini-handstand push-ups and occasionally can hold a full freestanding handstand for a few seconds, fair enough for someone in his late 40s, isn’t it? Let’s get a blank piece of paper out and answer at least three of above “What if – Questions”. 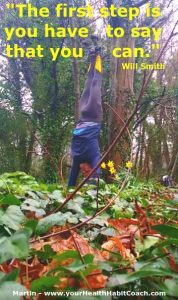 This entry was posted in Fitness Acticle, Quotes and tagged Free Handstand, Handstands, Wall Handstand, What if, What if Questions, Will Smith Quote on May 4, 2018 by admini. 1. What one of my “Men Only Pilates and Core Strength” class entails. 2. What the benefits of these Pilates Classes are. 3. What Pilates and other fitness and exercise equipment we use during those classes. 4. What I want you got get out of the classes. Find a full fitness and exercise class timetable with all current classes I’m currently teaching here. .Contact me with any question you might have or to book your course or trial class. This entry was posted in Pilates Classes, Pilates for Golf / Golfers, Pilates for Men, Videos and tagged Core Strength Classes, Flexibility Classes, in Dublin 18, in Dundrum, in Leopardstown, in Sandyford, in South Dublin, Mens Pilates, Pilates for Men, Sandyford Community Centre, Taney Parish Centre on May 1, 2018 by admini. Get a free monthly Newsletter videos, class updates, seminars etc.